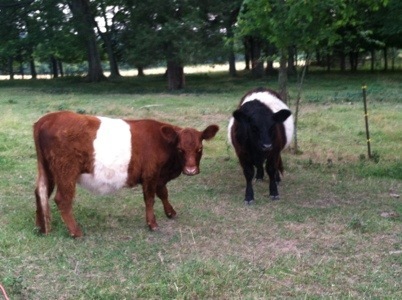 I caught our cows Sweetie (red/white) and Bossy (black/white) on tape during a recent shoving match. They are a breed of beef cow called Belted Galloways aka “Belties” for their big white belts around the middle. They are half sisters and are both actually very social; but cows do use their weight and their big heads to push just about anything out of the way. I was reminded of this the other day when Sweetie accidentally stepped on my foot!